In an effort to reveal the “evil face” of ISIS and expose the atrocities committed by jihadists, Iran has launched a cartoonist contest, offering awards for the best caricatures mocking the terror group as well as “arrogant” foreign leaders supporting it. At least 800 entry cartoons from 43 different countries around the world were received by the Iranian House of Cartoon. The committee then selected 280 from the heap, with winners expected to be announced on 31 May. 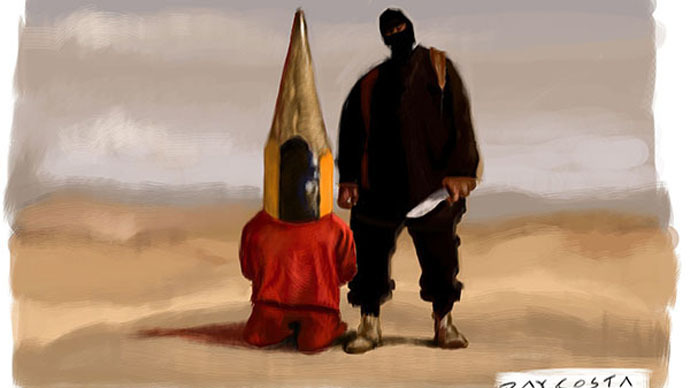 “In order to reveal the true nature of the Islamic State, we decided to hold this contest and have people submit their cartoons or caricatures. The Islamic State tries to associate itself with Islam but in essence it has no idea about Islam,” event organizer Masoud Shojaei Tabatabai told Iran’s Press TV. The contest is divided between two sections – cartoons and caricatures – that aim not only to expose the evilness of ISIS but the “unwavering support” of “arrogant” governments and leaders that the organizers see as supporters of Jihadi movement. In the caricature section participants are offered to mock one of six persons of interest: the ISIS leader, Abu Bakr Al Baghdadi, member of Qatari royal family, Hamad bin Khalifa Al Thani, and four western leaders – Israeli PM Benjamin Netanyahu, UK’s David Cameron, French president François Hollande and last but not the least US Barack Obama. Each participant is allowed to submit up to 5 works to try and compete for the top prize of $1500. Organizers plan to hold the contest exhibition in Iraq, Syria, and Lebanon.